There is no better way to explore Himachal Pradesh than to slide on the melting snow covering the mountains. When it comes to skiing, the snow-capped mountains of Himachal Pradesh are some of the best places to go. The hills of Himachal Pradesh are carpeted in layers of fresh snow; they have some of the best and highest ski slopes in the world. Ski slopes of Himachal Pradesh provide a platform for the adventurers- from beginners to professionals. Manali in Himachal Pradesh plays host too many international skiing activities. How about, sliding on the snow, like there is no end to exploring? This is what one experience when they go on a ski trail to Himachal Pradesh. 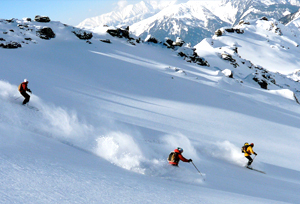 Skiing experience in Himachal Pradesh is simply euphoric that it will stick to adventurer's memory for a lifetime. Solang Nala (Manali), Narkanda (Hindustan Tibet Road), Kufri, Mahasu ridge (Above Kufri), Rohtang Valley, and Hanuman Tibba are the best skiing destination in Himachal Pradesh. Some of the other nearby places to enjoy skiing in Manali is Kothi, Patalsu, Marhi, Gulaba and Dhundi. Tourists can get a nice view of the snow-capped Himalayas from the slopes of Rohtang valley and hence there is a great rush of visitors and tourists almost round the year. In Himachal Pradesh, Kufri is probably the oldest place in Himachal Pradesh which is associated with skiing and the slopes are still in use during winter. Regular ski courses are organized by Himachal Pradesh Tourism Development Corporation (HPTDC). In winters, most areas of Himachal Pradesh are covered with a white sheet of snow and it simply looks breathtaking. Admiring the dramatic view from atop the ski lift, experiencing the rush of adrenaline as one passes through the edges of the mountain slopes- there's nothing like doing skiing on the slopes of Himachal Pradesh. Considered as the solitary station for winter sports enthusiasts, Himachal Pradesh offers is home to many snow-capped that few can match. Ample snowfall formation and beautiful slopes make Himachal Pradesh a heavenly location for skiing in winters. 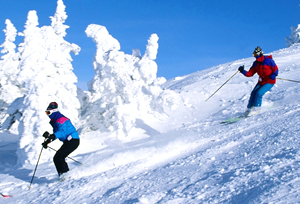 Availability of good ski slopes in Himachal Pradesh keeps the skiers happy and enthusiastic. Ski away and enjoy to the fullest and to your heart's contents the most awesome slopes of Himachal Pradesh. Snow skiing on Kufri undulating slopes is just amazingly refreshing.